The dental application of lasers is a developing field with great promise. Low- and high-power lasers have been used in oral surgery, endodontics, periodontics, and restorative dentistry among other specialties.,,,,,,, Low-level laser therapy (LLLT) is a promising treatment option for open wounds, and it has been examined on a clinical basis for treatment of rheumatoid arthritis, pain management, healing of atrophic ulcers, healing of indolent wounds, bone formation, and burns.,, LLLT does not involve thermal interaction. Instead, the photon energy causes photochemical, photophysical, or photobiological effects in cells and tissue. It has been demonstrated that the effects of low-intensity lasers on biologic tissues are processed in different ways, through the mitotic activity induction of the epithelial cells, modification of the capillary density, stimulation of the local microcirculation, and increase of the in vitro and in vivo collagen synthesis.,, It increases mitochondrial function, adenosine triphosphate (ATP), RNA, and protein synthesis. This interaction leads to increased oxygen consumption and membrane potential and enhanced synthesis of NADH and ATP. It consequently increases the cellular metabolism, possibly increasing the wound healing and accelerating the inflammatory process. Gingival hyperpigmentation is increased pigmentation beyond the normally expected degree of the oral mucosa. Several physiologic and/or pathologic factors can cause hyperpigmentation. However, the most common cause is physiologic or ethnic as a result of excessive melanin deposition by melanocytes, which in turn depends on the activity of enzyme tyrosinase., Gingival depigmentation is a treatment to remove the melanin hyperpigmentation. Several techniques including mechanical, surgical, electrosurgical, cryosurgical, free gingival grafts and lasers have been used.,,,,,,,, Scalpel surgery for depigmentation is a time-tested technique and remains the gold standard. The purpose of using LLLT as a part of postoperative therapy is to provide patients with the highest quality of healthcare. This should include minimal discomfort or pain and a shortened healing period. One of the possible mechanisms behind the therapeutic effects of LLLT is the interaction of photons from laser irradiation at optimal doses (therapeutic window) with specific receptors in the mitochondria. The aim of the present study is to evaluate and compare the effects of LLLT after depigmentation procedure. This study had a double-blinded, placebo-controlled, and split-mouth design. This study was conducted in the Department of Periodontics. The study protocol was reviewed and approved by the Institutional Review Board. Informed written consent was obtained from all patients. It included 12 patients in which 15 test sites and 15 control sites (total 30 sites) were treated for gingival hyperpigmentation. Inclusion criteria were the presence of melanin pigmentation associated with maxillary and mandibular anterior region. Patients with any systemic illness such as uncontrolled hypertension, uncontrolled diabetes mellitus, pregnancy, and smoking were excluded from the study. Sites extending from distal of the right canine to the midline and distal of the left canine to the midline of the maxilla or the mandible of the permanent dentition in each patient were selected. The patients were instructed for proper oral hygiene habits, and complete oral prophylaxis and root planing were performed 2 weeks before the surgical procedure. The patients who were esthetically cautious and exhibited excellent maintenance after phase 1 therapy were carefully chosen to be included in the study. The procedure was done under local anesthesia 2% lignocaine with adrenaline, which was infiltrated in proximity of the site being operated at. Surgical peeling was performed using number 15 surgical blade. After completion of the surgical process and bleeding stasis, any of the symmetrical surgical sites was randomly assigned for LLLT using a defocused diode laser at 1 mm distance for 5 min. The diode laser used had a wavelength of 810 nm with power setting at 1 W at continuous mode. To prevent the scattering of light to the opposite side, stents were prepared preoperatively using putty impression material. The stent was used to cover the control site during LLLT procedure. LLLT procedure was repeated each day until 7th day and photographs were taken on the 3rd, 7th, and 15th day using the same stent at control site [Figure 1]. All patients were instructed to take paracetamol 500 mg after surgery and continue for 2 days only in case of pain. After every laser exposure, the surgical site was coated with plaque disclosing solution (erythrosine in 1:50 dilution according to manufacturer's recommendation) for 30 s and then rinsed off. A photograph of the surgical site was taken using a Digital SLR Camera (Nikon D5100 SLR, USA), which was placed at 30 cm distance. The photographs were taken at 55 mm zoom, 1/100 shutter speed, f 14 aperture size, and ISO 4000 with a ring flash. The accuracy of the imaging software was estimated by measuring surface areas of shapes of known mathematical areas. The efficiency and reproducibility were then evaluated. The surface areas of patient's images were measured using imaging software. Actual measurements were also made of the patient's teeth to avoid any discrepancy in the size of image. Then, actual sized images were used for evaluation. Every photograph was then divided into two parts, control and test. A layer of the photograph was cut using the cutting tool in the imaging software, and the disclosing agent color was selected. The expansion tool of the software then calculated the same color in the whole layer and calculated the area in pixels. Pixel dimension was then converted into millimeter square using a reference object dimension in the software [Figure 2]. The surface area analysis was performed by one of the authors (VG) who were blinded to the treatment techniques and to the test and control sites to assure an unbiased determination. The visual analog scale (VAS) was used to evaluate the subjective pain level experienced by each patient. The VAS consisted of a scale with values ranging from 0 to 10, with the left end by the descriptor “no pain” and at the right end by “unbearable pain.” The subject was asked to mark the severity of the pain on this scale. The value marked by the subject was used as the VAS score. If the score was 0, no pain was registered. Scores between 1 and 3 were considered slight pain, scores between 3 and 6 were considered moderate pain, and scores between 6 and 10 were recorded as severe pain. Statistical Package for Social Sciences Version 16 (Armonk, New York, USA) was used for the statistical analysis. The unpaired t-test was used for the comparison of mean values between the test and control groups. The level of significance was taken at 5% (P < 0.05). Data are presented as mean ± standard deviation. All patients completed the study course and complied with the postoperative LLLT application appointments. Postoperative complications such as swelling, bleeding, or edema were observed in only one patient on the test site and all patients used analgesics for 3 days. At day 3, test site showed 1.26 ± 0.23 mm 2 and control site showed 1.45 ± 0.21 mm 2 stain uptake by the tissue which was statistically significant. 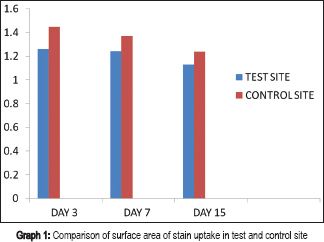 At day 7 and day 15, the test sites exhibited 1.24 ± 0.30 mm 2 and 1.12 ± 0.25 mm 2 stain uptake, whereas the control site at day 7 and day 15 showed 1.37 ± 25 mm 2 and 1.29 ± 0.28 mm 2 staining, respectively. At day 7 and day 15, the values were higher at control sites but were not statistically significant [Table 1] and [Graph 1]. All the patients were satisfied by the treatment outcome. At day 3, the mean VAS score was 4.43 ± 0.76 for the test site and 5.21 ± 0.58 for the control site. At day 7, the mean VAS score was 1.93 ± 0.73 for the test site and 2.21 ± 0.89 for the control site. There was no statistically significant difference in the VAS scores of both the groups. At day 15, the patients had no pain on either of the sites. Hence, the VAS scores were zero [Table 2]. Healing of periodontal tissue after surgical treatment has long been a subject of the study. The use of LLLT for oral and periodontal purposes has been the subject of numerous in vitro and in vivo studies. In this clinical trial, the wounds were assessed after depigmentation over 15 days to clarify whether LLLT with diode laser could or could not improve the healing process and postsurgical patient comfort. Within the limitations of this study, the findings revealed that LLLT promotes wound healing after depigmentation procedure until the 3rd day in humans. On the 7th and 15th day, the difference in healing was not statistically significant. The wound healing mainly includes fibroblasts, keratinocytes, and immune cells. Within a few days following surgery, epithelial cells start to migrate over the wound surface from the margins, whereas fibroblasts proliferate and lay a new connective tissue underneath the epithelial seal. During this period, cytokines and growth hormones expressed by the immune cells such as neutrophils and macrophages orchestrate the wound healing process., Previous studies suggest that LLLT application may accelerate wound healing by increasing the motility of human keratinocytes and promoting early epithelization, by increasing fibroblast proliferation and matrix synthesis and by enhancing neovascularization. It has also been shown that the expression of fibroblast growth factors by macrophages and fibroblasts is increased after LLLT application. Another effect of LLLT on wound healing is to increase the revascularization rate as it is known that successful wound healing following periodontal surgery is strongly influenced by the revascularization rate. A study by Ozcelik et al. has shown that LLLT may enhance epithelization and improve wound healing after gingivectomy and gingivoplasty operations. The basic principle of LLLT is based on the biostimulation or the biomodulation effect, which consists of the fact that irradiation at a specific wavelength is able to alter cellular behavior., This effect is achieved by acting on the cellular mitochondrial respiratory chain  or on membrane calcium channels. This action subsequently promotes an increase in cell metabolism and proliferation. In the present study, there was a significant difference in the uptake of the plaque disclosing solution on the 3rd day, but this difference was not significant on the 7th and 15th day. A possible explanation for this could be that surface epithelialization completes in 2–5 days though complete epithelialization occurs in about 1 month. The disclosing solution can stain only the raw surface. Therefore, it could not penetrate the deeper layers. This result is in contrast with a study Ozcelik et al., who found that LLLT applied sites after gingivectomy procedures have significantly lower stained surface areas on the 3rd, 7th, and 15th day. This study has a series of methodological limitations. First, the small sample size of the study may affect the reproducibility of our results, and, therefore, these results should be interpreted with caution. Second, healing after a depigmentation operation is a rapid and simple process, which is usually uneventful even when diverse techniques are used. In addition, although an image-analyzing program was used to determine the stained gingival surface, this method is still strongly operative sensitive. Therefore, further clinical, histological, and/or immunohistological studies with larger study populations including diverse clinical conditions are required to evaluate the exact benefits of LLLT on gingival healing and to correlate the clinical alterations with the findings at the cellular level. Within the limitations of this study, the findings revealed that LLLT promotes wound healing after depigmentation procedure until the 3rd day. On the 7th and 15th day, the difference in healing was not statistically significant. Dr. Mahesh Verma, Director-Principal, Maulana Azad Institute of Dental Sciences, New Delhi, India. Walsh LJ. The current status of low level laser therapy in dentistry. Part 1. Soft tissue applications. Aust Dent J 1997;42:247-54. Walsh LJ. The current status of low level laser therapy in dentistry. Part 2. Hard tissue applications. Aust Dent J 1997;42:302-6. Rizoiu IM, Eversole LR, Kimmel AI. Effects of an erbium, chromium: yttrium, scandium, gallium, garnet laser on mucocutanous soft tissues. Oral Surg Oral Med Oral Pathol Oral Radiol Endod 1996;82:386-95. Liu CM, Hou LT, Wong MY, Lan WH. Comparison of Nd: YAG laser versus scaling and root planing in periodontal therapy. J Periodontol 1999;70:1276-82. Kucerová H, Dostálová T, Himmlova L, Bártová J, Mazánek J. Low-level laser therapy after molar extraction. J Clin Laser Med Surg 2000;18:309-15. Ceballos L, Toledano M, Osorio R, García-Godoy F, Flaitz C, Hicks J. ER-YAG laser pretreatment effect on in vitro secondary caries formation around composite restorations. Am J Dent 2001;14:46-9. Khadra M, Kasem N, Haanaes HR, Ellingsen JE, Lyngstadaas SP. Enhancement of bone formation in rat calvarial bone defects using low-level laser therapy. Oral Surg Oral Med Oral Pathol Oral Radiol Endod 2004;97:693-700. Simunovic Z, Ivankovich AD, Depolo A. Wound healing of animal and human body sport and traffic accident injuries using low-level laser therapy treatment: A randomized clinical study of seventy-four patients with control group. J Clin Laser Med Surg 2000;18:67-73. Schindl A, Schindl M, Schön H, Knobler R, Havelec L, Schindl L. Low-intensity laser irradiation improves skin circulation in patients with diabetic microangiopathy. Diabetes Care 1998;21:580-4. Conlan MJ, Rapley JW, Cobb CM. Biostimulation of wound healing by low-energy laser irradiation. A review. J Clin Periodontol 1996;23:492-6. Saperia D, Glassberg E, Lyons RF, Abergel RP, Baneux P, Castel JC, et al. Demonstration of elevated type I and type III procollagen mRNA levels in cutaneous wounds treated with helium-neon laser. Proposed mechanism for enhanced wound healing. Biochem Biophys Res Commun 1986;138:1123-8. Reddy GK, Stehno-Bittel L, Enwemeka CS. Laser photostimulation of collagen production in healing rabbit Achilles tendons. Lasers Surg Med 1998;22:281-7. Newman MG, Takei HH, Klokkevold PR, Carranza FA. The gingiva. In: Carranza's Clinical Periodontology. 10th ed. Philadelphia: W.B. Saunders; 2006. p. 46-66. Ciçek Y, Ertas U. The normal and pathological pigmentation of oral mucous membrane: A review. J Contemp Dent Pract 2003;4:76-86. Tal H, Landsberg J, Kozlovsky A. Cryosurgical depigmentation of the gingiva. A case report. J Clin Periodontol 1987;14:614-7. Novaes AB Jr., Pontes CC, Souza SL, Grisi MF, Taba M Jr. The use of acellular dermal matrix allograft for the elimination of gingival melanin pigmentation: Case presentation with 2 years of follow-up. Pract Proced Aesthet Dent 2002;14:619-23. Nakamura Y, Hossain M, Hirayama K, Matsumoto K. A clinical study on the removal of gingival melanin pigmentation with the CO(2) laser. Lasers Surg Med 1999;25:140-7. Azzeh MM. 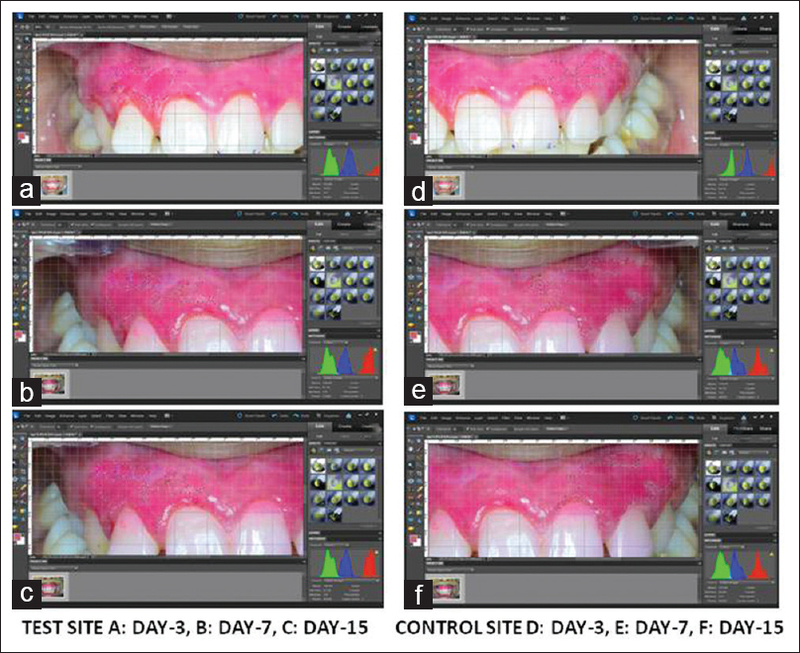 Treatment of gingival hyperpigmentation by erbium-doped: yttrium, aluminum, and garnet laser for esthetic purposes. J Periodontol 2007;78:177-84. Huang YY, Chen AC, Carroll JD, Hamblin MR. Biphasic dose response in low level light therapy. Dose Response 2009;7:358-83. Stahl SS, Witkin GJ, Cantor M, Brown R. Gingival healing. II. Clinical and histologic repair sequences following gingivectomy. J Periodontol 1968;39:109-18. Stahl SS, Witkin GJ, Diceasare A, Brown R. Gingival healing. I. Description of the gingivectomy sample. J Periodontol 1968;39:106-8. Tuby H, Maltz L, Oron U. Modulations of VEGF and iNOS in the rat heart by low level laser therapy are associated with cardioprotection and enhanced angiogenesis. Lasers Surg Med 2006;38:682-8. Donos N, D'Aiuto F, Retzepi M, Tonetti M. Evaluation of gingival blood flow by the use of laser Doppler flowmetry following periodontal surgery. A pilot study. J Periodontal Res 2005;40:129-37. Damante CA, Greghi SL, Sant'ana AC, Passanezi E. Clinical evaluation of the effects of low-intensity laser (GaAlAs) on wound healing after gingivoplasty in humans. J Appl Oral Sci 2004;12:133-6. Hopkins JT, McLoda TA, Seegmiller JG, David Baxter G. Low-level laser therapy facilitates superficial wound healing in humans: A triple-blind, sham-controlled study. J Athl Train 2004;39:223-229. Posten W, Wrone DA, Dover JS, Arndt KA, Silapunt S, Alam M. Low-level laser therapy for wound healing: Mechanism and efficacy. Dermatol Surg 2005;31:334-40. Silveira PC, Streck EL, Pinho RA. Evaluation of mitochondrial respiratory chain activity in wound healing by low-level laser therapy. J Photochem Photobiol B 2007;86:279-82. Alexandratou E, Yova D, Handris P, Kletsas D, Loukas S. Human fibroblast alterations induced by low power laser irradiation at the single cell level using confocal microscopy. Photochem Photobiol Sci 2002;1:547-52.